West Side Market | Cleveland, Ohio | dreaming of the next bite. 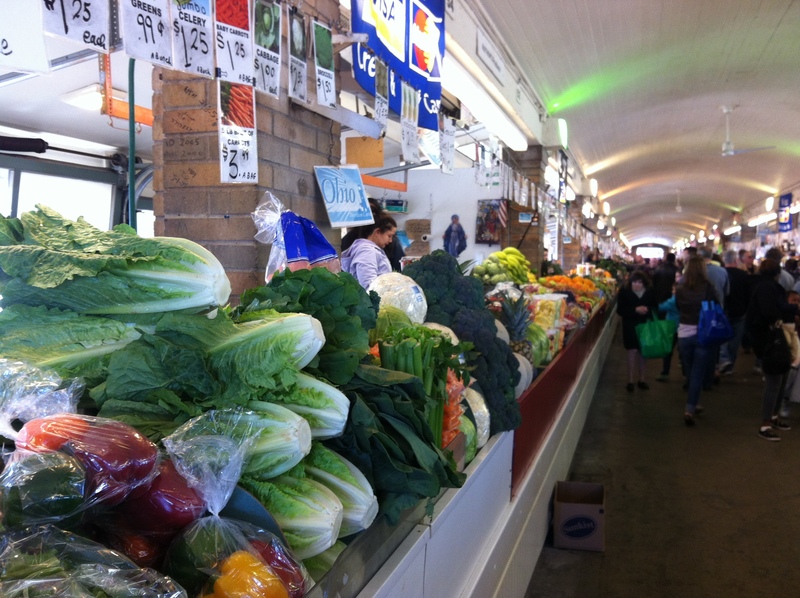 The day before Easter, we finally made our first trip to the West Side Market in Cleveland’s Ohio City neighborhood. I decided to take the whole crew with me for a mini road trip. We arrived shortly after lunch time (on a Saturday, they are closed Sundays), and it was packed with people. Inside, as expected, was a delight to the senses. We started in the produce section, which had it’s own entire building of vendors. The produce section was great. Rows and rows of colorful, fresh fruits and veggies, beautifully displayed in all their glory. Presumably most items are grown locally, although last I checked, mangoes do not grow in Northeast Ohio. I bought some, however, because they were big, ripe, and sweet (most vendors let you taste)….sold for 6 for $5, which is cheaper than I can buy them at the grocery store. Generally, the prices were fair, although no real “bargains” to speak of. I bought a pound of dried fruit for about $10, which seemed pricey, but turned out to be an absolutely delicious variety that you don’t normally see (including strawberries, star fruit, kiwi, papaya) – plus, we ended up snacking on it for the better part of a week. The guy who sold it to us was, quite obviously, not local. Seemed like he belonged in New York, haggling with tourists or something. Once inside the main building, (which I didn’t even get a picture of, if can you believe it?!) you could feel the energy of hungry CLE-people, who lined every aisle. There was a particularly long line at the gyro joint, which was buried about fifty people deep. Also quite popular was the crepe stand, serving up delicious looking crepe concoctions, grilled right there in the booth. People everywhere were bustling, eating, buying, tasting, chatting, spending. It was cool. 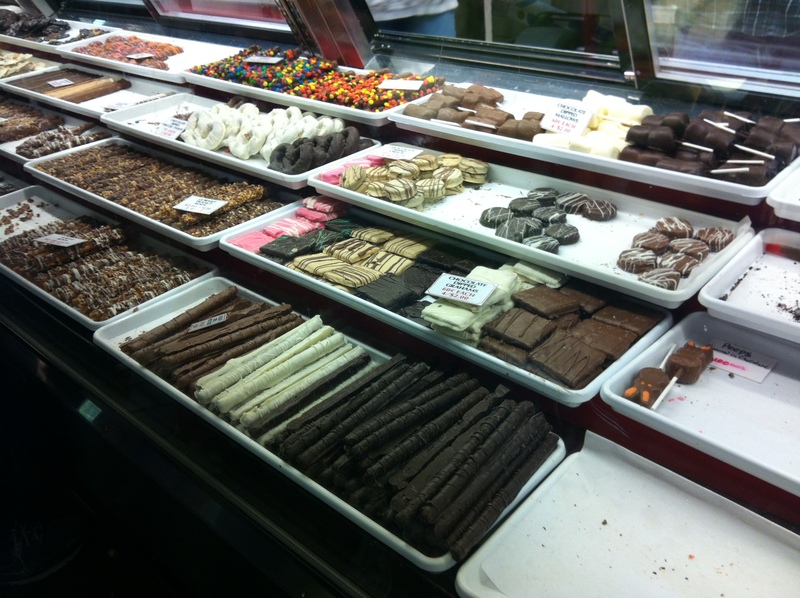 Campbell’s Sweets Factory won us over with samples galore. They offered five different self-serve samples to taste, but I immediately went to the Dichotomy corn (awesome name) because it was a mix of caramel and cheese corn, a combination I invented (I thought) years ago. Sinfully good and totally addicting!!! 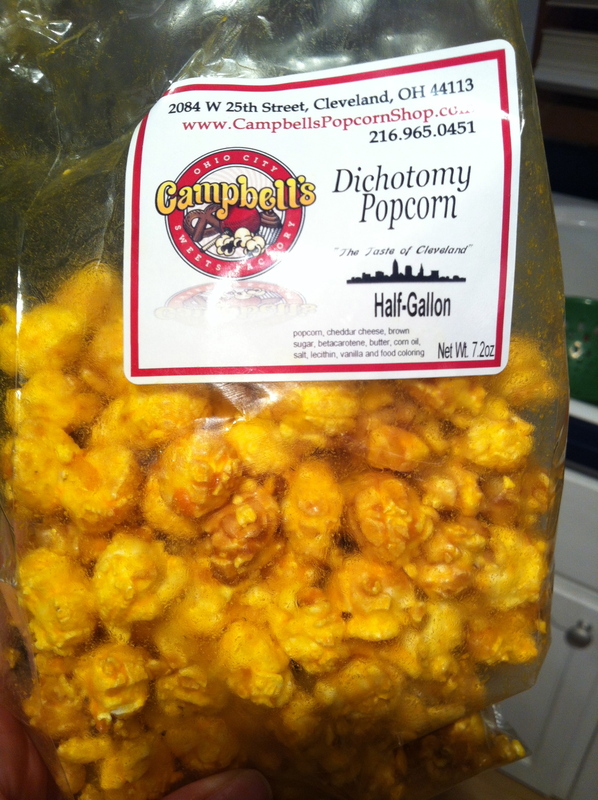 I bought two bags, one Dichotomy and one caramel, which I gave to my dad and he went absolutely nuts for it. And he’s practically a caramel corn connoisseur. The sweets at the Market were over the top. 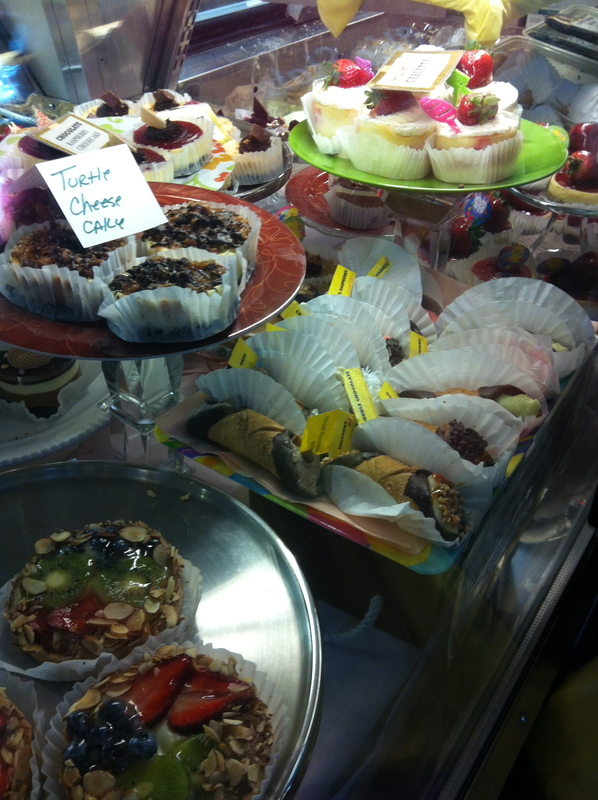 The Market was definitely reminiscent of NYC, with it’s seemingly endless supply of beautiful fresh baked goods in every little storefront. I couldn’t pass up on taking home an apple fritter, although I must say, I’ve had better. They were a bit dry, and no chunks of apple (sigh). 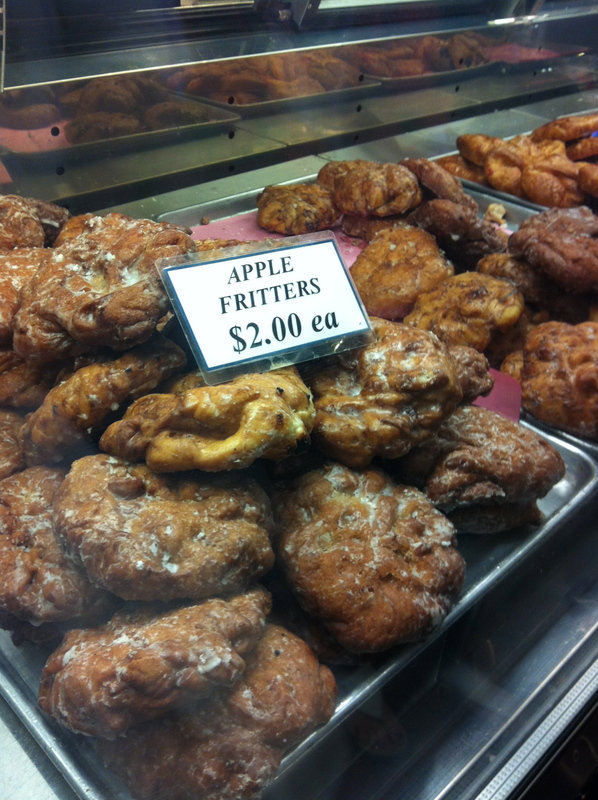 For real deal apple fritters, check out Johnnie’s Bakery in North Canton. But back to WSM. 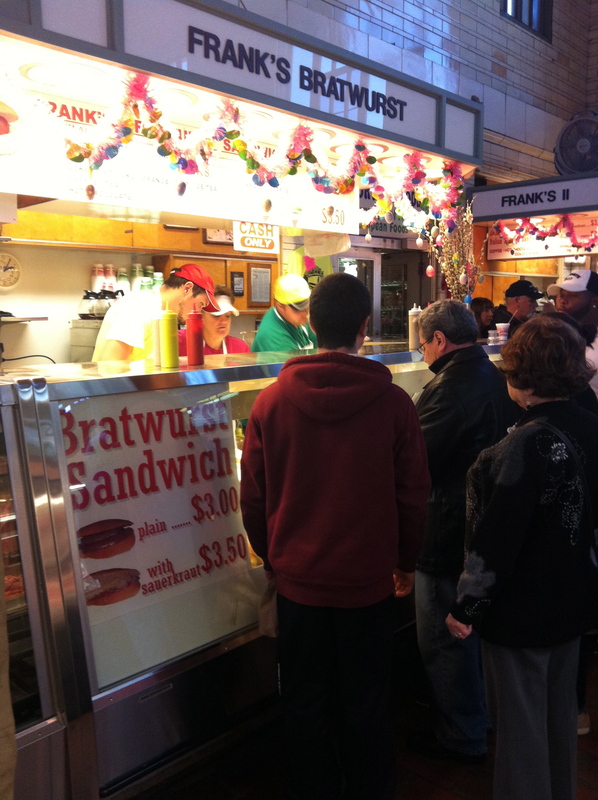 Apart from my popcorn samples, I still hadn’t had anything to eat yet, so I opted for a brat at Frank’s toward the end of our shopping excursion. The line wasn’t terrible and was moving quite fast. 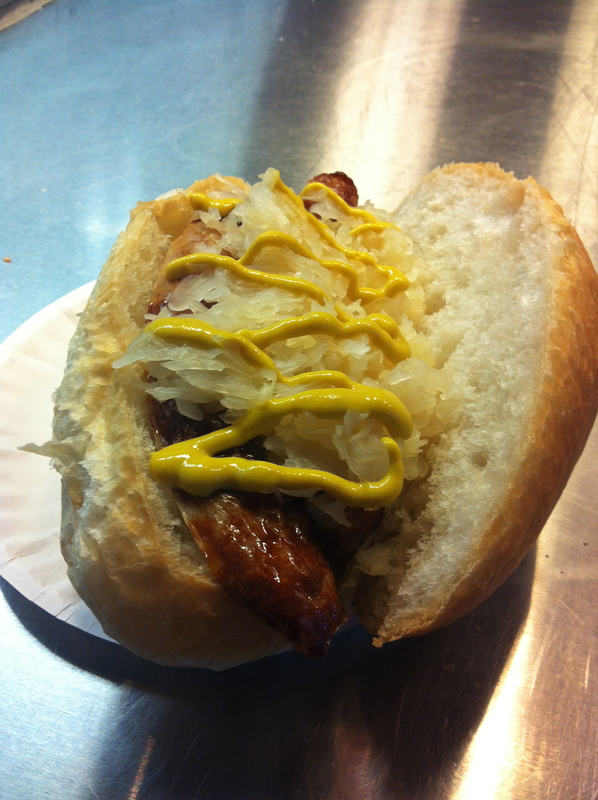 Of course I went for the sauerkraut and took the chef’s recommendation of the hard roll. Sounded weird but it was so goooooood…and no doubt I looked ultra-classy walking around the market shoving this beauty in my face. 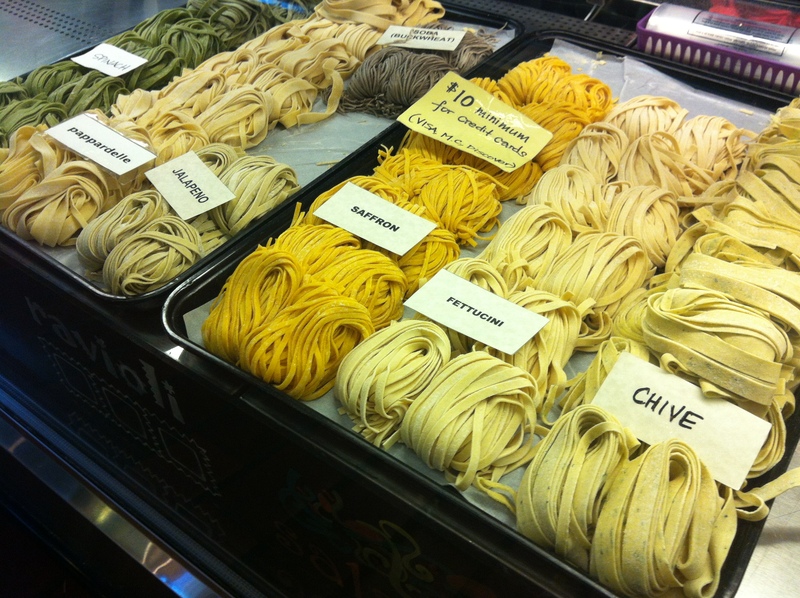 Though I didn’t buy any, this pasta was gorgeous and homemade by Ohio City Pasta, which is coincidentally the supplier for Noodlecat on East 4th. Needless to say, I recommend a trip to the market, even if you live in Canton. Sadly we have nothing like it close by. We have a few local farmers’ markets (still in their infant stages if you ask me), but that’s about it. 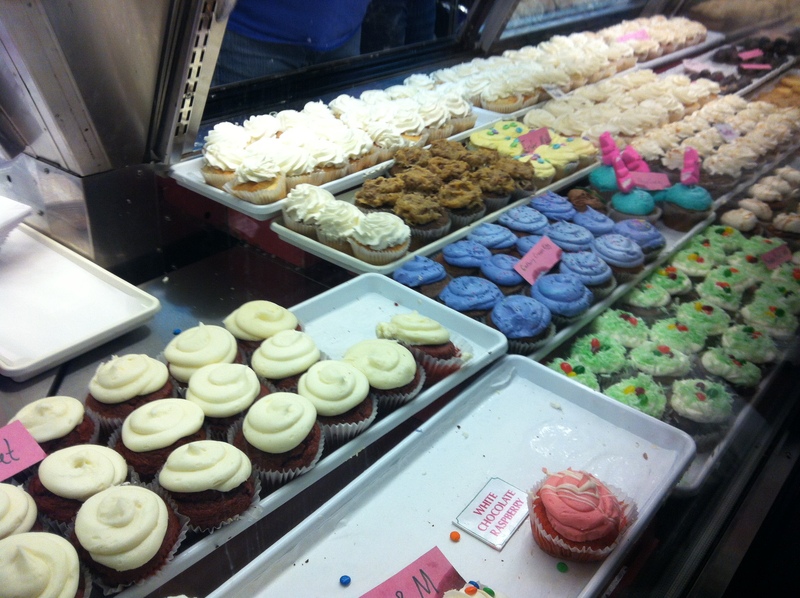 West Side Market was also ethnically diverse (which we majorly lack to Canton). I could do without some of the overpriced goods, and also parts of the meat section, which contained just a little two many “parts” of the pig – though I suppose if you’re going to eat those sweet creatures, you better not waste a single thing. Still, yay Cleveland! What better way to support the local economy than to shop at a culturally interesting, 100-year-old market; it gave us a welcome dose of big city flavor. 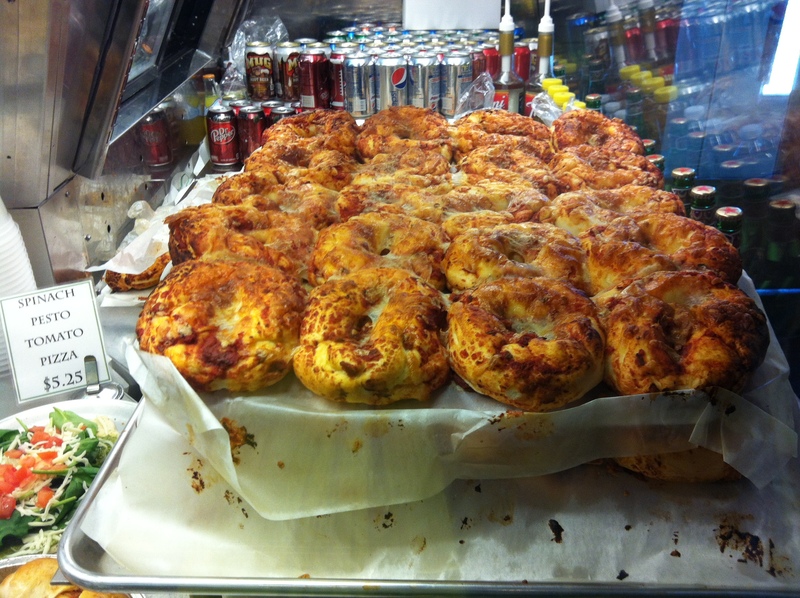 This entry was posted in Cleveland, OH and tagged bakery, local, market, noodles, popcorn by Yvette (@foodiedreamer). Bookmark the permalink. Awesome take on the market. I love hearing about it from fresh eyes. I have been going since I was a little kid in the 70’s with my folks.